The book has been placed on a CD for years of enjoyable computer viewing. The CD comes with in a plastic sleeve with a custom label. This would make a great gift for yourself or someone you know who may have attended Boot Camp in the 50s 60s or 70s. You will not be disappointed. Most of the book is canned photos and stories generic to any company that went through the training. About 25% of the book is specific to Company 363 from September 1963 thru November 1963. 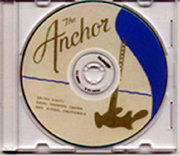 The CD includes 97 pages of high resolution color and black and white images of life in naval boot camp. More than 211 general pictures depicting life in Boot Camp no matter when you went through it.